Wonderful!! I love old cemeteries. Such a wonderful combination of history and artwork. So many stories. Nice contrast with the light and dark stones. I love to walk through old cemeteries but I never remember to bring my camera. I too find cemeteries great places to take pictures. So many interesting memorials, sculptures, and so much history. Now, that is interesting. 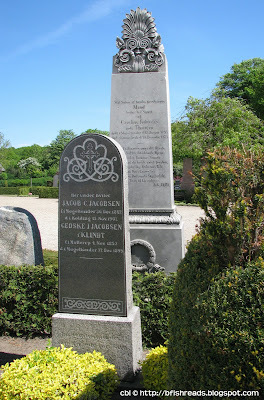 Last time I went to Denmark, I toured a lot of cemeteries as well to see where my ancestors were buried. Thank you for stopping by my WW. So glad to discover I'm not the only devotee of old cemeteries. The artwork on these tombstones is beautiful. I like to look at dates and names and try to figure out what happened to these people. These are so beautiful! Though I grew up in Denmark, I have rarely seen so beautiful headstones. But I know that Møgeltønder teems with wonderful sights and buildings. Mogeltonder is truly a beautiful area. As you know I really love your country! I love old cemetaries, as dark as that seems. Every headstone has a story. The ones in Poland are particularly fascinating. Gorgeous! Cemetaries can be so fascinating. I find cemetaries so fascinating and we recently purchased a home with a cemetary across the street. We love walking through and looking at the names and dates. These Danish stones are particularly beautiful though! Wonderful stonework, so intricately done. Strangely I'm attracted to cemetery's whereas my mom is very scared of them. Great shot.